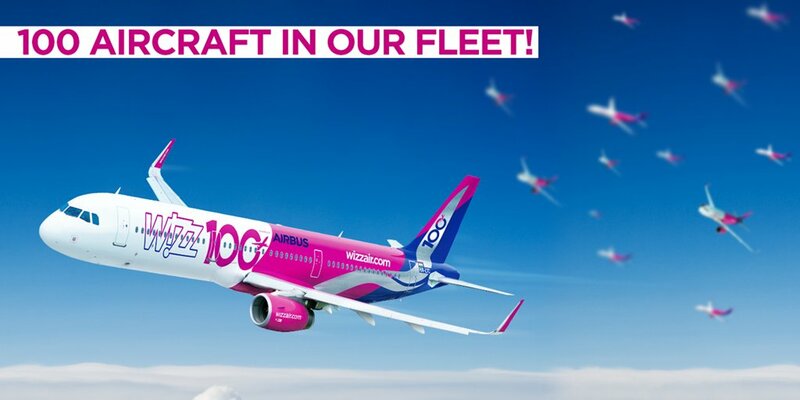 Wizz Air, one of Europe’s fastest growing airlines and the leading low cost carrier in Central and Eastern Europe, celebrates a unique milestone today as its fleet reaches 100 aircraft. To mark the event, a special livery on one of Wizz Air’s super-efficient Airbus A321 aircraft was unveiled in Budapest and, reflecting the ever-increasing importance of Wizz Air to the communities it serves, the WIZZ Foundation was announced, focusing on four different areas: Health, Education, Child Care and Emergency Aid. Wizz Air’s fleet has grown to 100 aircraft just 14 years after the start of operations, providing truly low fares to over 155 million passengers in total and making flying affordable for more people than ever before. Wizz Air will continue to develop its network and stimulate underserved markets with the lowest fares, as it drives towards its ambition of becoming one of the top 5 airlines in Europe. Wizz Air’s future growth plans are underpinned by committed orders for a further 268 latest-technology aircraft for delivery until the end of 2026, bringing the fleet to almost 300 aircraft, carrying 100 million passengers a year, supported by a team of 10.000 colleagues. A strong focus on digitalization will at the same time enable Wizz Air to become even more customer-focused as well as introduce further efficiencies into the business. The WIZZ modern fleet with an average age of just 4.6 years is an essential asset in the airline’s ultra-low cost business model, along with the features of the game-changing Airbus A321, the most efficient single-aisle aircraft flying. The larger number of seats compared to the Airbus A320 means that the Airbus A321 is more efficient and environmentally friendly, with the A321ceo delivering a 10% unit cost saving when compared to the Airbus A320ceo. By 2023, 75% of Wizz Air’s seats will be flown on an Airbus A321. A further step-change will start in 2019, when Wizz Air takes delivery of the first of 256 Airbus A320neo family aircraft, an aircraft whose next-generation technology engines will deliver a further 10% unit cost saving when compared with even the current Airbus A321ceo. The aircraft will be powered by Pratt & Whitney PW1100G-JM engines, the most environmentally friendly and most quiet engine in its class, which will deliver a minimum 16% fuel burn advantage compared to the A321ceo. “Wizz Air started to operate its first Airbus aircraft 14 years ago. Today WIZZ has become a true success story, and we are proud to have played a major role in this journey, providing the most efficient aircraft with the lowest operating costs combined with unbeatable comfort in the widest single aisle cabin in the skies, ” said Eric Schulz, Airbus Chief Commercial Officer.